My almost-six-year-old has, from a remarkably early age, been fascinated by all things scary and spooky, and by Halloween in particular. 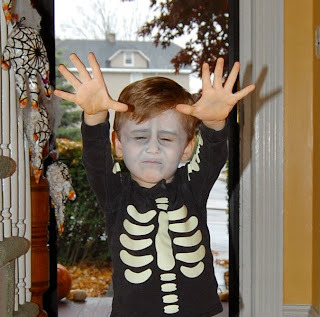 I don’t know if it’s an association with his birthday (which falls just five days later), or pure temperament, but it sometimes borders on obsession—he spends much of the year counting the months not till Christmas, but till the end of October, and he has for some years now had his costumes selected for every upcoming Halloween until about 2025. Accordingly, he has a large and ever-growing section of Halloween- and otherwise spooky-themed books and videos. Seeing as the holiday approaches, I thought I’d post a list of his favorites of the moment (as of 8 p.m. on October 26, at any rate—favorites lists move fast at this age!). The Monsterologist: A Memoir in Rhyme, by Bobbi Katz, illustrated by Adam McCauley. A collection of whimsical monster-themed poems, kind of Shel Silverstein–style, framed as a series of recollections by a professional studier of monster. It’s packaged marvelously with foldouts and evocative illustrations that assist in the illusion. That Terrible Halloween Night, by James Stevenson. A recent library discovery (as it will have to be for others; it appears to be out of print)—a fun little picture book from 1980 on which a grandfather explains why, ever since a certain Halloween long ago, nothing really scares him anymore. Stevenson, a former New Yorker writer and cartoonist who’s written literally hundreds of children’s books (What’s Under My Bed? being perhaps the most famous), displays his usual gentle humor throughout. The Dangerous Alphabet, by Neil Gaiman, illustrated by Gris Grimley. The darkest, creepiest, most macabre ABC book since Edward Gorey’s Gashleycrumb Tinies. No actual demises here, but a lot of creepy, disturbing (but very clever) imagery alongside the smart writing—Gaiman and Grimley manage to pack a remarkable amount of storytelling into the usually limiting alphabet framework. It might be a bit too disturbing for many kids of the age to be reading even very sophisticated ABC picture books. Dash, of course, took to it immediately and loves it still. Vunce upon a Time, by J. Otto Seibold and Siobhan Vivian, illustrated by J. Otto Seibold. Author-illustrator Seibold’s trademark vivid, trippy aesthetic makes this story of a shy vegetarian vampire named Dagmar, who learns to face his fear of humans, memorable indeed. Tell Me Another Scary Story...but Not Too Scary!, by Carl Reiner, illustrated by James Bennett. I mentioned this book in this space not long ago, and it’s still in heavy rotation, largely thanks to the included CD with the author’s own evocative reading of his tale. The Nightmare Before Christmas. It’s not like it was a surprise that would be one of Dash’s favorites. But we were a bit taken aback at how early in his life it happened—he saw a preview for it on another DVD when he was just three, and would not stop pestering us until we agreed to let him see it. Thinking he might be too young, we had remote in hand should anything prove too scary. But, as always seems to happen in such cases, he loved it passionately start to finish, and wasn’t frightened a bit. In what’s probably news to exactly no one, this is a fantastic movie to enjoy with the entire family this time of year; for a 17-year-old animated film, it holds up amazingly well. The Teacher from the Black Lagoon…and More Slightly Scary Stories. An entry in the vast and excellent Scholastic Storybook Treasures collection of classic kids’s books turned into lightly animated videos, it became a go-to almost immediately. This one is an adaptation of a classic fear-of-school book, in which a kid’s worries about his new teacher turn out to be somewhat...overblown. The DVD also includes versions of Mike Thaler and Jared Lee’s several sequels (in which the same boy’s similar angst about the librarian, gym teacher, etc., is dispelled), and Dash loves them all. Monsters vs. Aliens. This big-budget animated blockbuster from last year isn’t all that Halloween-y (though I suppose the old B horror flicks that inspired it were), but Dash insisted that I include it. It’s funny, it’s well-acted by the usual dazzling roster of Hollywood stars performing in today’s animated fare (here it’s Reese Witherspoon, Hugh Laurie, Will Arnett, Seth Rogan, and Paul Rudd, among others), and it features monsters. what’s not to like? It’s a little strange, given that I’m a words person both personally and professionally, that some of my very favorite children’s picture books in recent years have been wordless, or nearly so. Last year, it was Jerry Pinckney’s resplendent The Lion and the Mouse that I was flipping over (since it ended up winning the Caldecott, I guess I wasn’t alone!). 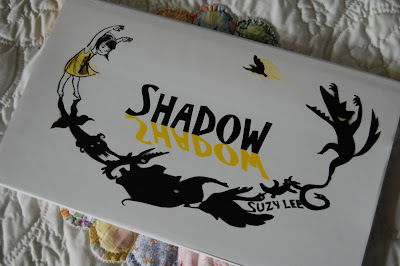 And I recently encountered its equivalent for 2010: Shadow, by Suzy Lee. In a way, this shouldn’t be so surprising, since the first picture book I read by this South Korean–born author-illustrator was one of the highlights of my four years covering children’s books at Cookie magazine. Wave, a word-free narrative of a little girl’s encounter with the ocean, demonstrated Lee’s immense talent not just as an artist but as a storyteller. 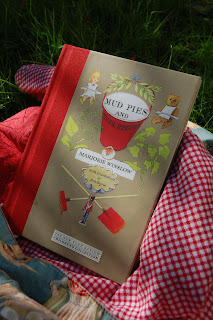 The book is downright cinematic, as clever and funny and smart as great silent films, and all the parents and kids I knew fell in love with it instantly. In Shadow, Lee uses the same basic framework—again, the story is told through progressive illustrative variation on one basic idea. But while both titles are, at root, about playful imagination, this one has a very different, and perhaps even more ideal, setting. 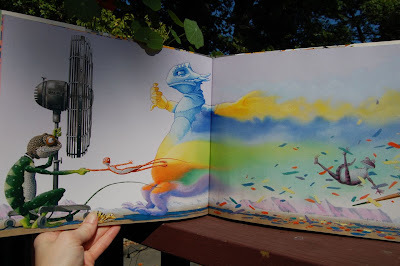 The book, which you read turned on its side horizontally (in other words, each page has “landscape” orientation), begins with a little girl switching on the light in a cluttered attic. You see the typical contents of such a space (a ladder, old boots, a hanging bicycle, a broom, a vacuum cleaner) above the fold, and below it, the shadows cast by each object, all rendered in charming black-and-white charcoal-and-pencil drawings. On the next spread, the girl sees the shadows and begins to play—and her imagination starts to take hold of what we see right away. While the shading at the bottom half continues to reflect what she’s literally doing above at first—making a bird shadow with her hands, say—the dark shapes quickly start to morph on their own, the broom and ladder becoming jungle flowers and vegetation, the bicycle wheels a couple of moons, the vacuum cleaner an elephant, and so on. Soon the “real” world above the fold starts to disappear, leaving only the girl herself, while the shadow world of play correspondingly fills out more and more, takes on color, and eventually invades and takes over both halves of each spread. The girl joins and interacts with her mind’s creations, the scene becoming more and more jubilant and wild, until the book’s only words—“Dinner’s ready!”—interrupt. The pages immediately flash back to attic and shadows, respectively (with most of the attic’s contents in the top half in different places than they were before, and in even greater disarray). The girl clicks off the light, and there’s one black spread of complete darkness—before another click. 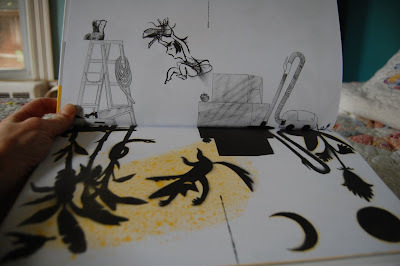 At the end, we see the shadow creatures of the girl’s imagination—and the girl’s shadow too!—still dancing on the bottom half of the last spread. My description doesn’t do it all justice, but maybe this will: The first time you read the book, if you’re anything like me, you will be turning each page in open-mouthed astonishment at the simple sophistication of what Lee is doing. And by the book’s end, you will be unable to repress a gigantic grin at what you’ve just experienced. Shadow is marvelous, the best picture book I’ve seen this year. And I can’t wait to see what Lee’s fertile mind and agile hand will turn to next. A good deal of the excellent kids’ music I hear these days is uptempo, upbeat, and just generally up. Sure, Recess Monkey will throw in a slow song or even a lullaby now and then, but they’re the exceptions to the rule. And albums of nothing-but-lullabyes are often unsuitable for anything but putting actual infants to sleep, unable to hold the interest of toddlers (or their parents). But then there’s Elizabeth Mitchell. Parents familiar with her previous three CDs, by now pretty much legends of the genre, already know of her ability to craft full albums of calm folky brilliance. 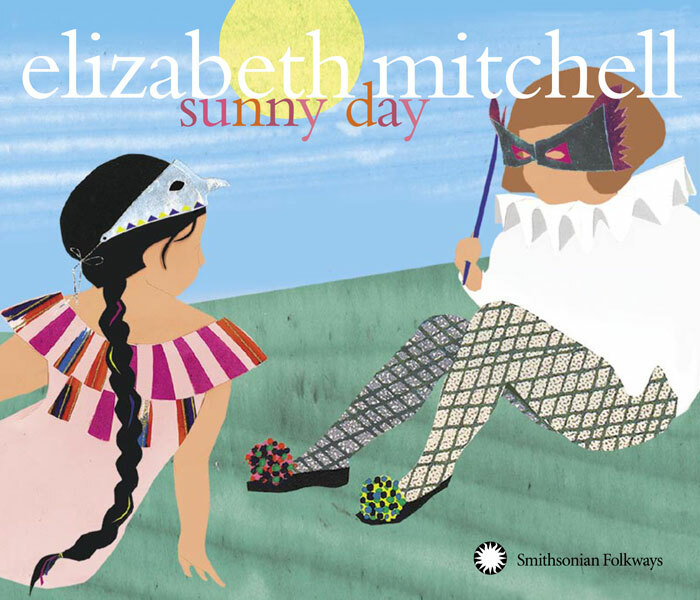 On her latest release, Sunny Day, Mitchell and her family (mainly her husband, Daniel Littleton, and their nine-year-old daughter, Storey, who wrote two of the album’s 19 songs) branch out a little musically and work with some big names from both kid and adult music, without ever losing the pleasingly placid vibe that’s her trademark. The music sounds fabulous throughout, and the arrangements and instrumentation chosen seems to suit each song perfectly, some quite plain, some a lot more complex, but all just right. And then there’s Mitchell’s voice—smooth, gentle, sweet, with touches of Suzanne Vega and Natalie Merchant but really a sound all her own, it may be responsible for the most comforting vocals in kids’ music today. For his first year-plus, it seemed as if our younger son, Griffin, had no interest in television whatsoever. This was one of those facts that was great in the abstract (“He’ll spend all his free time on reading and active play!”) but actually kind of a problem on a daily basis, at least once he started walking. You couldn’t distract him with videos or TV shows for a few minutes to cook dinner or take care of a necessary task or phone call. Since he’s the kind of kid who has the knack for finding the most dangerous item in any room to play with, this was not good. Luckily for the bad parents in us, it was only a phrase. Griffin began watching PBS and Nickelodeon shows along with his five-year-old brother a few months back, first intermittently, then more enthusiastically. (Like the Body Snatchers, TV gets us all in the end.) He likes several of the same ones Dash is fond of, from Charlie and Lola to Super Why!, but there’s no question he has his very own favorite now: Dinosaur Train. This program, which premiered on PBS in 2009, admittedly sounds like the cynical result of a Hollywood-style children’s-TV pitch meeting—“It’s got dinosaurs…and trains! Greenlight it, baby!” But this CGI-animation program is a product of the Jim Henson Company, and accordingly very sharp. Dinosaur Train’s main character is a young T. rex named Buddy, who has been adopted by a family of Pteranodons. 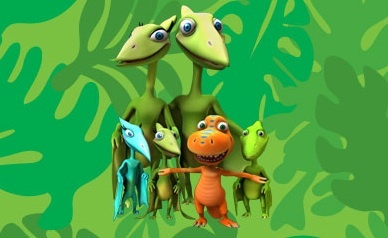 He and his siblings are fascinated by the differences between dinosaur species, so each episode, their parents take them on, yes, the Dinosaur Train. The train takes them magically across the globe and through time to meet other dinosaurs from various lands and eras, allowing them to explore the entire span of the species's existence. Griffin, a typical two-year-old boy who loves both trains and dinosaurs, is this right in the forefront of the program’s target demographic; by now, he’s singing along with the theme song the moment it comes on. While watching, he is as dead to the world as any soap-opera addict; he will not be distracted from his Dinosaur Train. And as disturbing as that may be, well, at least we can change a load of laundry without worrying Griff will scale the bookshelves before we return. Parenting is all about small victories, right? When you pick up a new children’s book by an author who’s won three Caldecotts, you know you’re probably in for something special. Art & Max, by David Wiesner (best-known to me for two of his winners, The Three Pigs and Flotsam), is nothing less than a picture book about the creative process itself. That might sound a little daunting for a young audience, but thanks to a savvy simplicity, Wiesner is remarkably effective at getting the message across to its intended target. It’s a story of painting dinosaurs—the brusque, confident Arthur (clearly a carnivore) and eager but inexperienced little Max, who comes upon Arthur (whom he insists on calling “Art,” to his addressee’s great annoyance) painting a portrait and wants to try his hand at, well, art. Mainly to get Max to leave him in peace, Arthur sets him up with an easel and some paints. Right away, Max comes up against one of the artist’s first challenges: What should he paint? Stumped, he asks Arthur, who suggests arrogantly that Max paint him. The smaller dinosaur loves the idea—and immediately starts slathering colors directly onto his friend’s body. Arthur’s reaction to this, and Max’s subsequent efforts to make things right, take the body of the larger dinosaur through a variety of vivid, even trippy combinations of color and deconstructed form. In the end, Max must break “art” down to its basic building blocks in order to put his friend back together. There’s a giant metaphor going on here, of course, but I think the direct “Art = art” personification may be mostly for literary-device-steeped parental brains. What kids see is opportunity, at least if my two-year-old is any indication. Shortly after reading Art & Max for the first time, Griffin marched off to get his older brother’s crayons and spent an extended period of time drawing, designing, creating.... I’m generally not a believer in instant inspiration, but I can’t come up with another explanation. Griff was not much of a crayonist before reading this book; now they’re part of his daily regimen. And while I don’t know if the book will have this transformational effect on all two-year-olds, I’m certain most children will be fascinated (as my already-crayon-obsessed five-year-old is as well). 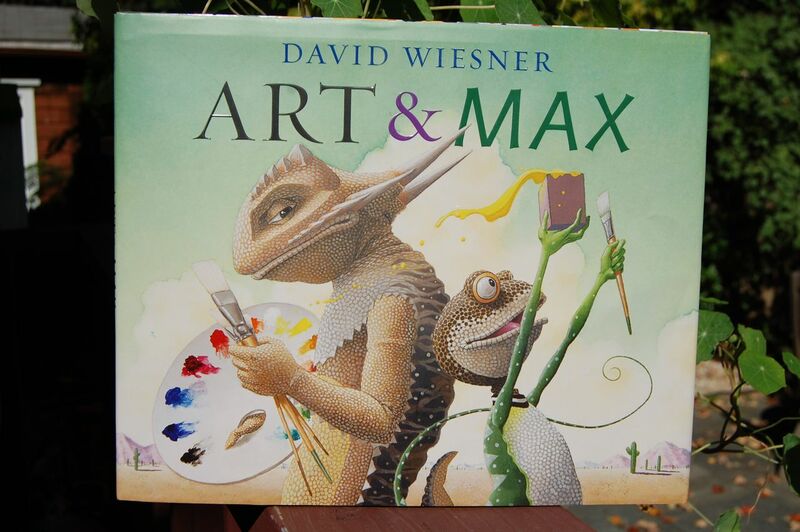 So I think Wiesner already at least one family in his corner, rooting for his unprecedented fourth Caldecott! Winslow’s tone is studiously serious, as befits the subject matter, and children will appreciate the lack of any hint of a patronizing tone. Yet she accomplishes this while never losing a certain twinkle: “Doll cookery is not a very exacting art. The time it takes to cook a casserole depends on how long your dolls are able to sit at table without falling over.” (You can almost hear Julia Child saying it, can’t you?) 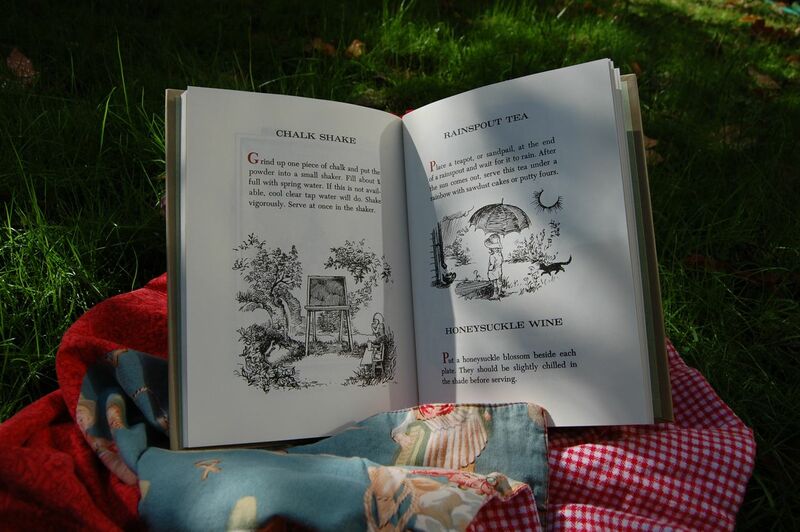 The accompanying illustrations by Erik Blegvad are equally charming. The recipes themselves range from basic appetizers (Stuffed Sea Shells: “Scoop up a shovelful of sand.... Pack this into the tiniest sea shells you can find. Sprinkle these with a pinch of dry sparkling sand and serve.”) to main dishes both spare (Fried Water: “Serve small portions, because this dish is rich as well as mouth-watering.”) and more complex (Left-Handed Meatloaf and its variant, Right-Handed Meatloaf). Desserts are not neglected (e.g., Pine Needle Upside-Down Cake), nor are appropriate wine pairings (Mums ’61, from the flowers, of course). 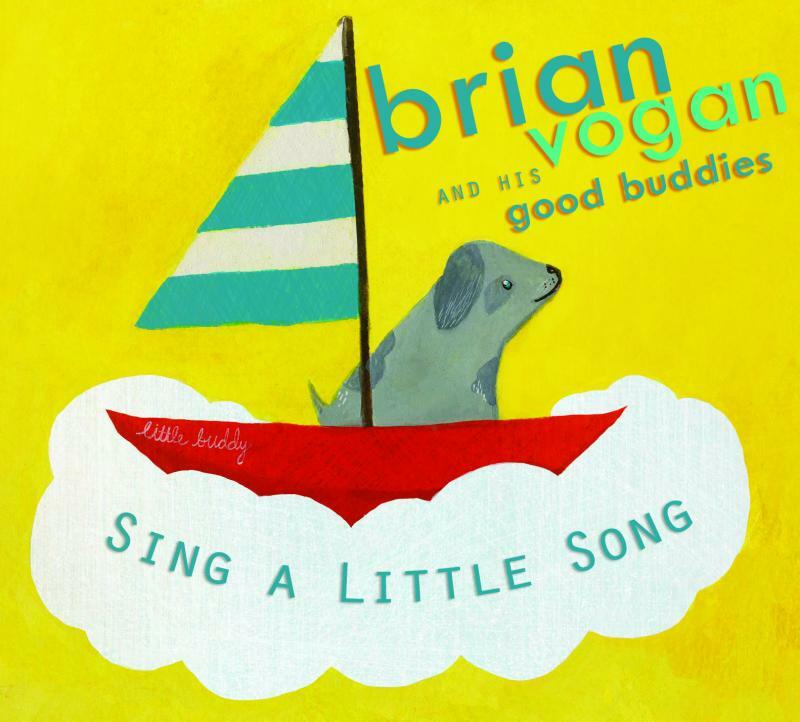 Seattle’s Brian Vogan is one of those makers of children’s music whose songs, if you don’t listen to the lyrics, sound like they could be adult pop-chart hits from over the years. On their latest album, Sing a Little Song, he and his band, His Good Buddies, dabble in various genres, but present throughout is the influence of 1980s new wave, both the British (XTC, Nick Lowe, dare I say even Adam and the Ants?) and American (the Cars, late Talking Heads) varieties. Of course, none of that would matter if the music didn’t appeal to children. But Vogan, an early-childhood music teacher when he’s not on stage or in the studio, has that covered too. His songs may have sophisticated harmonies and a mature sound, but from the Elvis/Big Bopper ’50s rock of “A Tiny Little Frog” to “Last Thanksgiving” (a song about an escaped giant turkey, performed in a Bright Eyes–esque narrative style), his subject matter couldn’t be more on target for its intended audience. He seems to have a knack for coming at subjects from a slightly different angle, even when traveling well-worn paths like space travel and dinosaurs. There’s a refreshing quality to his tunes that keeps kids coming back again and again. Which is great, since you’ll be happy to tap your toes to these songs repeatedly as well. It’s sometimes a little surprising to me that in the era of 3D television, spoken-word audio still hangs on. Clearly car trips have something to do with it, at least where kids’ products are involved (though in-car DVD players are even encroaching there). But even at home, my five-year-old sometimes decides he wants to listen to a story rather than watch something. The power of storytelling remains strong, I guess. Audiobooks—generally chapter books read by a well-known actor—make up a large part of the selection, of course. But there are also a number of “storyteller” CDs out there, read by their own writers, who are usually professional performers of one kind or another. Dash seems to gravitate toward these even more, listening to them over and over, memorizing both the stories themselves and the way the storytellers choose to tell them. >His favorite is probably Tales of Wisdom and Wonder, a book-and-CD combo of folk tales from various cultures interpreted and read by British storyteller Hugh Lupton (who sounds uncannily like John Oliver of The Daily Show). Lupton’s reading style has a measured pace that savors the words and style of each story, and Dash is rapt as he listens, especially to “The Peddler of Swaffham,” an English tale of magical dreams that he adores. Another in high rotation is Tell Me Another Scary Story...but Not Too Scary!, a picture book written by the great Carl Reiner that’s accompanied by a CD on which the author reads his own story. Reiner has been a master of audio his whole career, as anyone who’s ever heard his work on the 2,000-Year-Old Man albums knows, and he has kid listeners in the palm of his hand here. It’s a basic story--a first-person narrative of a Hollywood kid who’s befriended by a neighbor who makes props for scary movies, and then must save the day when something terrible happens to his new friend. Reiner’s delivery is full of expression and dramatic pauses that fill kids’s faces with delight. And I have to say, there’s something especially gratifying about seeing a master entertainer succeed with his third or fourth generation of audience. As the title suggests, this is Reiner’s second such outing; we’re clearly going to have to go back and get the first one. We also recently came across a new contender. I wasn’t familiar with Bill Harley, but that just shows my ignorance; the two-time Grammy winner and NPR contributor has been enthralling kids with his enthusiastic blend of music and old-time storytelling for years now. 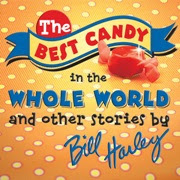 His latest recorded release, The Best Candy in the Whole World, contains a set of stories about acts of kindness, most adapted from folk tales, with two composed by the artist himself. Harley’s style is quintessentially American, and his work is a throwback to folksy storytelling my parents’ generation would have listened to as kids. Dash, who had never heard anything like it, was immediately transfixed.